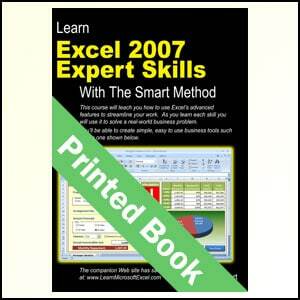 Please note that this book is only suitable for the Apple Mac version of Excel 2016. 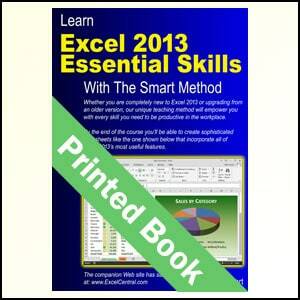 (There’s also an Excel for Windows book available (ISBN: 978-1-909253-08-7). 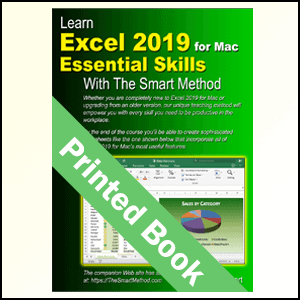 The book will equip you with excellent Excel 2016 for Mac skills, good enough to impress any employer, but it doesn’t confuse by attempting to teach skills that are not common in the workplace. Only users who have advanced requirements need progress to the Excel 2016 for Mac Expert Skills book. Every lesson is presented on two facing sheets of A4 paper (the pages are much bigger than in any other Excel book). You can complete each self-contained lesson in a few minutes. Each lesson has a sample file that models a real-world business problem. The teaching method used in the book was developed and refined using over ten years of experience teaching real students Excel skills in classroom courses. The teaching method is fun, absorbing and virtually 100% effective. Instruction is logically structured into sessions and lessons. While this makes the book ideal for self-instruction, you can also use it to run your own, highly effective, adult training courses. This has made Smart Method books a popular choice for schools, colleges and universities all over the world. You’ll immediately appreciate the value and relevance of each skill as it is taught. Both IT professionals and absolute beginners will love this book because it avoids needless technical jargon and concisely explains everything you need in a simple and no-nonsense way. AOL Time Warner, The United States Army, Daimler Chrysler, Motorola, HSBC, Barclays, American Express, Allied Irish Banks, Imperial Tobacco, Volvo, The BBC, British Petroleum, The Foreign and Commonwealth Office, Unilever, The Institute of Chartered Accountants, The Ministry of Defence, Keele University, Deutsche Bank, HBOS, Transport For London, The Performing Rights Society, Scottish Power, The Office of the Parliamentary Ombudsman, BAE Systems, RBS, Marks & Spencer, Virgin, O2, BMW… and many, many others.